Manji (Takuya Kimura) is a great samurai, but when he is unable to protect his sister, he is cursed with immortality. Hoping to regain his soul and mortality by fighting evil, he travels the lands until he encounters Rin (Hana Sugisaki) who looks a lot like his sister and needs help to avenge her parents. 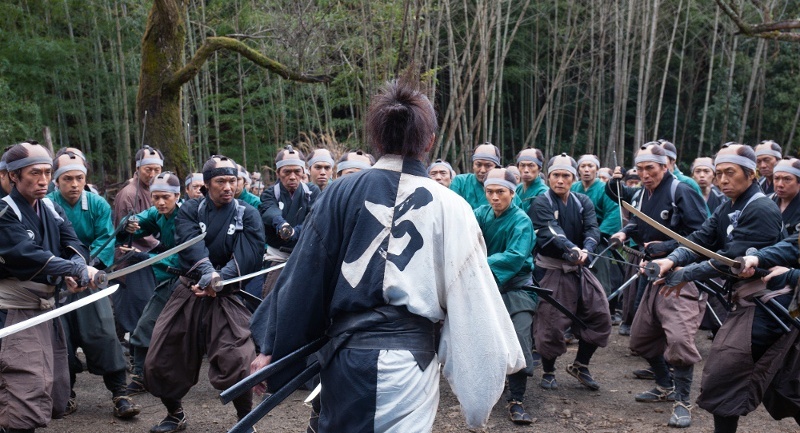 Manji promises to help and gets drawn deeply into the fight against Anotsu (Sôta Fukushi) and his master swordsmen. It feels like Blade of the Immortal is one and the same scene repeated over and over again. It’s a good scene, but not that good that I wanted to see it that often and for that long. I like good fight scenes in movies. Although nothing beats a well-choreographed hand-to-hand fight, sword fights come in a very close second. And Blade of the Immortal is chock-full of them. The problem is that there is really nothing more to the film than a series of sword fights that all build on the same trope: Manji being hopelessly outnumbered and winning anyway. Since the film is about 2.5h long, that gives it a lot of time to repeat the same fight over and over again. In the end that means you understand why Manji only wants to get rid of his immortality. It’s not all bad: the film has its funny moments, a good cast made up of beautiful people and the sword fights really are pretty nice. It’s just the repetition that ground me down. That and the frustrating treatment of the women in the film: I was really hoping that Rin would get to take a more active part in things, especially since she was training so hard throughout, but she remains passive (and she’s pretty much the only woman in the film, so that’s another issue). Maybe if the film had been shorter, maybe if I had known the manga series, maybe then I’d have appreciated the film. But I doubt it. Summarizing: Not my cup of tea. 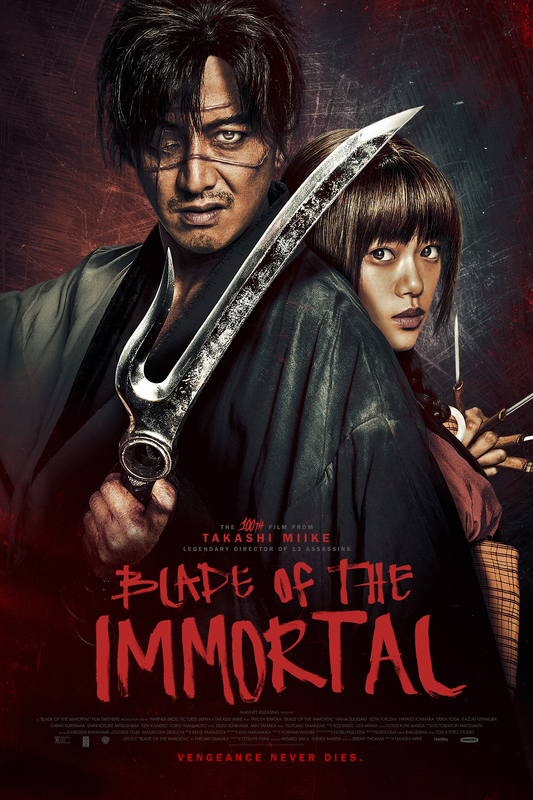 This entry was posted in movies and tagged /slash Filmfestival, 2017, Blade of the Immortal, Chiaki Kuriyama, Ebizô Ichikawa, Erika Toda, Hana Sugisaki, Hayato Ichihara, Hiroaki Samura, Kazuki Kitamura, Ken Kaneko, Min Tanaka, Mugen no jûnin, Sôta Fukushi, Shinnosuke Mitsushima, Takashi Miike, Takuya Kimura, Tetsuya Oishi, Tsutomu Yamazaki, Yôko Yamamoto by kalafudra. Bookmark the permalink.